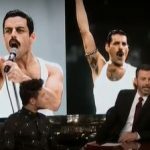 Appearing on ABC’s Jimmy Kimmel Live, the American actor said the two Queen members “were there constantly” during filming, which he notes began with “the most terrifying thing ever” which was a re-creation of Queen’s performance at Live Aid. Mike Myers plays a record company executive who says, “No one will ever bang their heads in a car to ‘Bohemian Rhapsody. '” (Funny because Wayne’s World was responsible for Bohemian Rhapsody’s resurgence). The film opens November 2nd. Watch the clip, it’s not a trailer for the film but you’ll learn more about it. Side note: I like when Jimmy Kimmel is funny and NOT political.